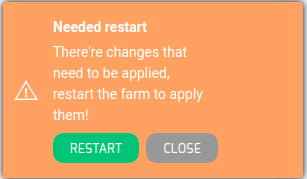 When modifying any parameter in a HTTP/S farm through the Update green button at the bottom, it would be needed a manually restart in order to apply the changes, so a message will be shown at the left bottom of the page to alert the sysadmin that there are global parameters or backend changes that need to be applied via a farm restart. The system administrator is able to modify whatever parameters are needed and then restart the farm service to apply all of them at the same time and when the time is more suitable. Those colours codes are the same all over the graphical user interface. Every HTTP(S) farm (or virtual service) is able to manage several web services through the same HTTP farm like a reverse proxy, therefore one HTTP virtual IP and port could handle more than one load balanced web service. For that reason, a service under an HTTP farm is a concept that offers the virtual host flexibility and then a list of backends will be shown for each service created. Virtual IP and Port. These are the virtual IP address and/or virtual PORT in which the farm profile will be bound and listening in the load balancer system. To make changes in these fields, ensure that the new virtual IP and virtual PORT are not in use. In order to apply the changes, the farm service will be restarted automatically. Rewrite Location headers. If enabled, the farm is forced to modify the Location and Content-location headers in responses to the clients. If they point to the backend itself or to the VIP (but with a different protocol) the response will be modified to show the virtual host in the request. If the option enabled and compare backends are selected then only the backend IP address is compared, this could be useful for redirecting a request to an HTTPS listener on the same server as the HTTP listener. The Disable SSLV2, Disable SSLV3, Disable TLSV1, Disable TLSV1.1, Disable TLSV1.2 selectable buttons if selected, avoid using those given protocols. Thus, once a protocol is disabled, it’s ciphers will also be disabled. Ciphers. This field is used to build a list of ciphers accepted by SSL connections in order to harden that connection. Before a client and server can begin to exchange information protected by TLS, they must securely exchange or agree upon an encryption key and a cipher to use when encrypting data. Further information about security can be found on external resources such as Wikipedia. kEECDH+ECDSA+AES128:kEECDH+ECDSA+AES256:kEECDH+AES128:kEECDH+AES256:kEDH+AES128:kEDH+AES256:DES-CBC3-SHA:+SHA:!aNULL:!eNULL:!LOW:!kECDH:!DSS:!MD5:!EXP:!PSK:!SRP:!CAMELLIA:!SEEDWhich they’ll be enough to pass through an A+ in ssllabs . SSL Offloading. This option only appears if you hardware supports it, and it set the ciphers with AES. Certificate Enabled. The selected SSL certificate will be the certificate that the farm will be able to manage. The services within an LSLB farm with HTTP profile provides content switching capabilities for web virtual services to deliver multiple web services and applications through the same virtual IP and PORT, which helps to unify web applications through one single domain, manage virtual hosts, manage URLs, configure redirects, configure persistence and backends per service. Every service within an LSLB farm could have different properties, health checks or backend list, and some regular expressions can be used as match conditions that can specify which service should be used per request. Once the new service is applied, the HTTP farm profile will parse every service conditions in order to match the correspondent service for each client request. Those services conditions could be determined by URL patterns, specific headers or redirection and allow to identify several web services in through the same farm. Virtual Host. This field specifies the condition determined by the domain name through the same virtual IP and port defined by an HTTP farm. In order to discard this condition just leave it empty. This field supports regular expressions in PCRE format. Url pattern. This field allows you to determine a web service regarding the URL the client is requesting through a specific URL pattern which will be syntactically checked. In order to discard this condition just leave it empty. This field supports regular expressions in PCRE format. The Virtual Host and URL pattern fields are used by Zevenet in order to take decisions at the time of match to a certain service, so if any value is configured in these fields the request will try to match it if it doesn’t match the request will try to match to the next service. It’s recommended to include a last service as the default one if no match has been produced. Redirect URL. The URL to redirect. If Virtual Host and URL pattern match then Zevenet sends an HTTP Location Header response to the client in order to be redirected to the configured URL. PARM: a URI parameter. Another way to identify a client session is through a URI parameter separated from a semicolon character that is used as a user session identifier. In the example http://www.example.com/private.php;EFD4Y7 the parameter will be used as the session identifier. After the service configuration, it’ll be required to update the changes through the green button Submit. WEIGHT. It’s the weight value for the current real server. More weight value indicates more connections delivered to the current backend. By default, a weight value of 1 will be set. The values range available are from 1 to 9. Check out our video to know how easy is to configure an HTTPS redirection with Zevenet EE.